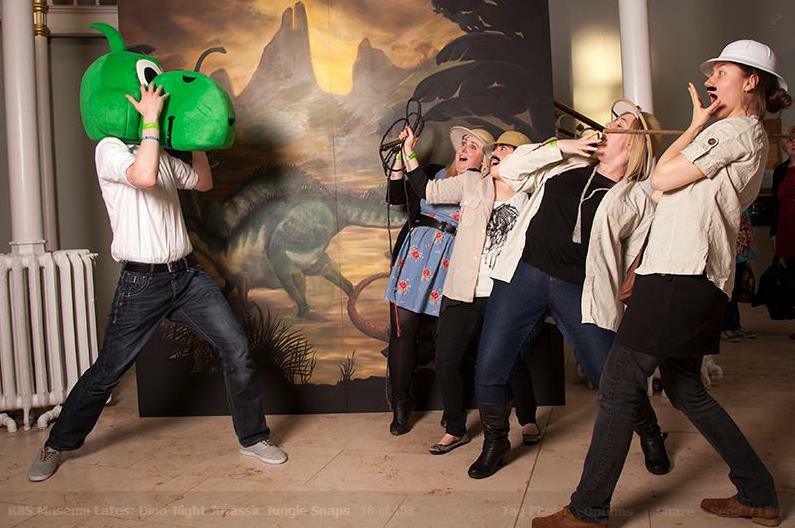 A few weeks ago I went along to a special night at the National Museum of Scotland with some of my friends. They do these "adult only" nights a couple of times a year, it's basically a big themed party in the museum where you can have a drink and a dance, take part in cool activities and experiments, listen to talks/lectures, and generally have a bit of fun. My friend Sam had sent us round a link on Facebook when it was first announced so we'd all been getting mega excited about it for months! The theme for the event was Dino Night, so there were lots of dinosaur themed activities going on like T-Rex mask making and experiments with dinosaur poo (yes!). In the main atrium, where the bars were located, there was live music from DJ Auntie Flo (hehe) and an aptly named band called Miniature Dinos. There were also scantily clad dancing girls....although I don't quite understand how they fit the theme, or why they were there really (sexist eyebrow raise). One of our highlights of the night was a silent disco - I somehow made it through uni having NEVER gone to a silent disco so I was really excited to see this on the flyer. It was a good laugh dancing away in headphones although there were only 2 channels and most people seemed to be on the same one (B*witched and Hanson - oh yeah!) so there wasn't that much mystery! Also the room was absolutely boiling hot - it brought back memories of sweaty discos at the student union, ha. One of the funniest parts of the night came courtesy of a man in a costume. In all the promo material leading up to the night they had talked about how "Tyrone the T-Rex" would be making an appearance. Now we all thought this would be someone in a comedy dinosaur costume, a bit like Piff The Magic Dragon, but nooooooo this was like a proper real life ("real life") dinosaur. I was standing right outside its tent when they announced it was about to come out and I thought "ah awesome, I'll get a brilliant photo when he walks out". So the tent door opens and out charges this MASSIVE DINOSAUR right at me!! I was genuinly terrified! Anyway, it then walked around for a bit terrorising some more people - swinging its huge tail all over the shop and knocking drinks over etc. Proper scary, but brilliant fun! All in all we had a great night - if you haven't been to one of the Museum Lates before then I'd definitely recommend keeping an eye out when they announce the next one. We did learn though that you need to be quick off the mark when signing up to activities though as we went along about an hr after the event started (we prioritised going to the bar for a drink...rookie mistake!) and everything was fully booked already. Next time we'll be pros though and will know to get in there early to sign up for lots of things so we don't miss out on the fun!